The bride on a budget needs a wedding dress that looks gorgeous but doesn't cost a bomb. So we've found these beauts on the high street. I was a bride on a budget. Luckily, even though I love fashion and value my personal style, I would never even think of buying a dress that cost over €1000. The wedding industry makes millions every year on suckers who have to put themselves in debt for the 'biggest day of their lives'. They hire an opulent venue, take a two-minute journey in a two grand car, prepare favours that no one will remember and wear a dress they can't go to the toilet in unaided. If I sound like a cynical beeatch, it's because I am. I've been to too many weddings to believe that they have to cost the same price as a house deposit. Don't get me wrong; I love weddings. I loved my own wedding. But unnecessary splurging does not impress. Much. OK, you can't help be wowed by the effort some couples go to. But trust me, there are ways to thrill your guests, if that's what you really want, even if you are on a budget. Whether you choose to spend less because you think wedding spending is out of control or if you just don't have the money to be extravagant as much as you want to, you can, in fact, have a wedding that looks expensive, even if it's not. And you don't have to go on Don't Tell The Bride to do so. Let us know in the comments if you would like a guide to having a gorgeous wedding for less. Because we've got the experts on hand that have got you covered. 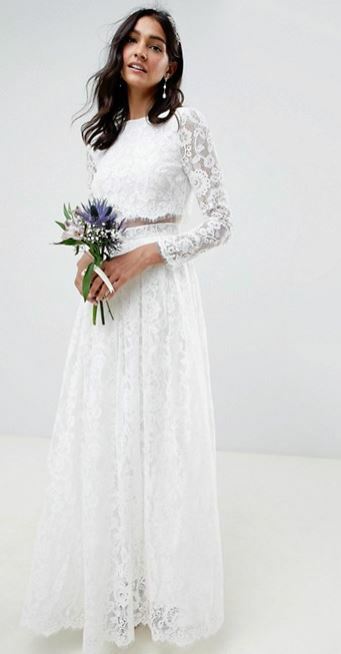 These high street wedding dresses are perfect for an impressive budget wedding. They could also be a good choice for if you're having a separate legal ceremony (if you're getting married abroad or not having a 'traditional' wedding). How did we miss this amazing party dress from Dunnes?